According To Pope Francis, Atheists Can Go To Heaven Too but the next day the Catholic Church confirms atheists still go to hell, after all because Jesus hates us. Nothing was said about us believers in the Goddesses such as good old Mother Nature, the Norns who spin our fates or the entities I call Lady Luck and Goddess of Infinity. BOJ’s Kuroda says pain from bond yield rise is manageable which is pure wishful thinking. Japan can’t let interest rates rise above ZIRP levels for a reason: the huge, huge overhanging levels of debt! The US fell into the Japanese trap, too. As has England and some European countries. Interest rates can and do suddenly shoot upwards when debt loads are too great. This is why taxing the rich is so important, only they can pay down huge debts. And globally, the very rich refuse to do exactly that. Another day and another tornado/flood/hail disaster in the Red States that voted against Hurricane Sandy aid and who want to cut FEMA money or force cuts in all other systems to pay for Red State disasters. This bizarre world of the right wing ‘We hate the Feds except when we want Fed money’ gang is out in full force demanding we all fund their disasters for them while they withhold disaster aid to liberal states that give the majority of funds to FEMA in the first place. 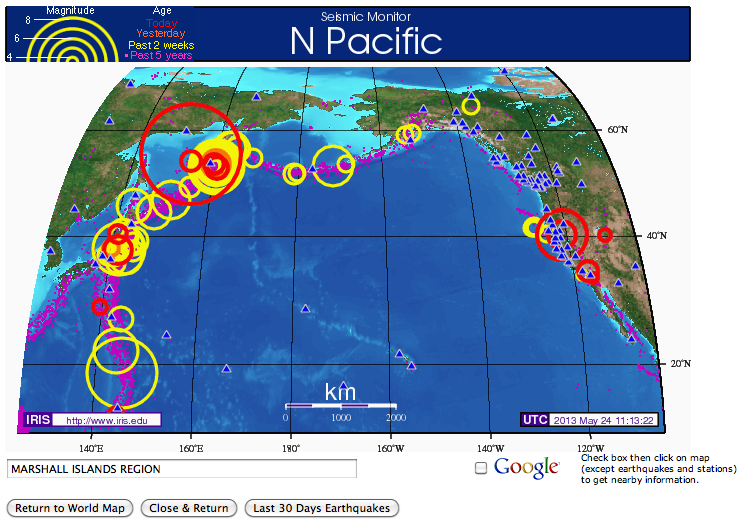 In the last 24 hours the Northern Pacific plate region had a series of quakes one of which was quite big and many of the volcanoes in the chains up there are erupting or threatening to erupt and due to the sudden, very hard shift in the plate alongside central to Northern Japan is affecting the other sectors of the massive subduction faults northwards of Japan. The series of hard shakes at the upper and lower end of California shows that stresses on the entire landscape due to the locked San Andreas is causing more and more auxiliary quakes. And to alert everyone, Congress cut funds for the very good previous maps and as of this morning, the crummy map we now have is not even functioning at all.